Archaeologists have found evidence for human occupation of Mongolia starting in the Lower Paleolithic (perhaps 500,000 years ago). * The area has shown evidence of human occupation ever since. Before Genghis Khan, the Mongolian nomads followed a typical pattern of nomadic peoples, alternating between vast empires and small-scale tribal organization. The first empire was built by the Hunnu, a proto-Mongolian tribe. The Hunnu Empire (3rd century BCE-1st century CE) played a major role in shaping the social and political structures of Central Asian nomadic tribes. 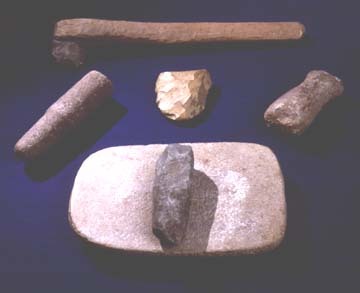 Neolithic tools, from the collection of the National Museum of Mongolian History. In 93 CE the Xianbei, an ancient Mongolian nomadic tribe, defeated the Hunnu, replacing the empire with its own leadership. Several states followed in succession: Toba, Jujan, Altai Turk, Uighur, Kirgiz, Khitan, and Jurchid. * By 1162, the year of Genghis Khan's birth, the Mongolian tribes had fought so many futile battles against external enemies that the economy collapsed and the population sank into poverty, fear, and uncertainty. 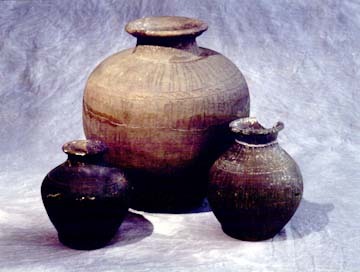 Hunnu Empire pottery, from the collection of the National Museum of Mongolian History. The nomads were organized into tribes, clusters of families whose men descended from the same leader. Each tribe lived in its own region and had a council headed by an elected leader, or khan. His kin formed an elite, or incipient aristocracy that changed depending on the leadership. A man became a leader through his charismatic personality, as well as his family's high status. Thus any son could inherit leadership from his father, not just the oldest son. * While some nomadic societies are egalitarian, Mongolian tribes were not. There was always an aristocratic branch or a hierarchy of families within a tribe.